The Great Helen has a wingspan of 130-140mm that matches and often exceeds that of the Great Mormon and Common Birdwing - two of the other large Papilionidae that occur in Singapore. 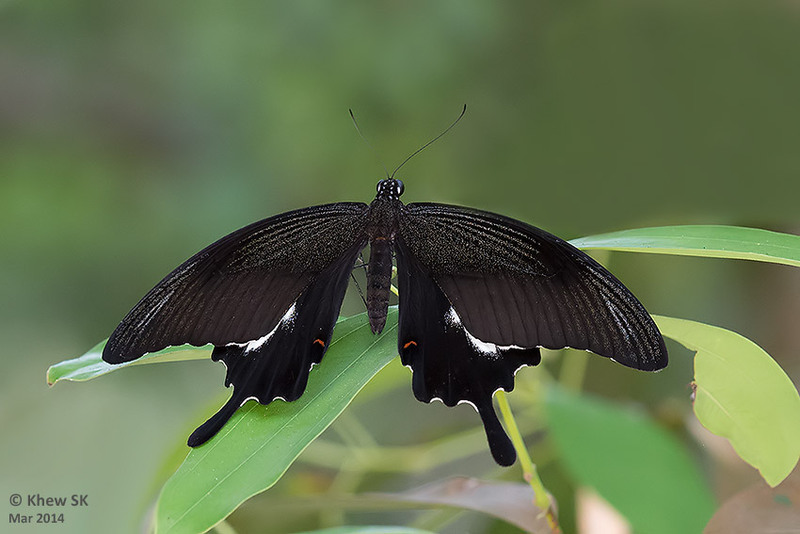 A forest-dependent butterfly, the Great Helen is often seen flying erratically at tree top level in the nature reserves of Singapore. Its caterpillar host plant, Maclurodendron porteri, is probably a forest plant that is not found outside the nature reserves. The full life history of the Great Helen is recorded here. After a period of active flying, the Great Helen is often observed to rest with its wings opened flat as is shown in the photo above. This species exhibits an example of "startle display" strategy. At rest with its wings opened flat, the butterfly's forewings conceal the white patches on the hindwings, making it appear totally black. But when startled, it flashes the white patch to 'dazzle' a would-be predator momentarily, giving it a precious moment to make good its escape.